YANTAI, China — Yang Luzhou, who lives here in an industrial town facing North Korea across the bay, is about as far as can be from Americana. He is even farther from John Mellencamp’s “Our Country,” the flag-waving soundtrack for Chevrolet’s latest marketing campaign in the United States. But just the other day, the classic “Bear Went Over the Mountain” and the Confederate anthem “Dixie” wafted through the factory while he fiddled with a Chevrolet Aveo car door on a General Motors production line. G.M. is hoping to change that for future generations of Chinese. It is counting on Mr. Yang, 27, and his 2,300 fellow assembly line workers here to help produce 200,000 cars this year as part of a giant bet to turn the Chevrolet brand into a household name in China. It’s good news, certainly for the Chinese, that GM is trying to grow its market. But here at home the picture is not so rosy. I was in Clare, Michigan, last weekend visiting my sister and her family. While there I learned that a local plant would close down, Mid-Michigan plant to close its doors. The plant was a supplier to Ford, and employed 139 local workers. Losing 140 workers might not seem like much, but Clare’s population is just over 3000 people, so the economic impact will be substantial. The county unemployment rate was almost 10 per cent in 2004 and I understand it’s not any better now; it’s still among the poorest counties in central Michigan. Indeed, one of my sister’s favorite local restaurants was forced to close its doors just a few days ago due to lack of business. Half of all 17-year-olds lack skills needed to get a job in a modern auto plant. Though I’m a big fan of the PBS radio show Car Talk since it’s so much fun to listen to, I can’t find any humor in this “car talk.” Just the blues. > nonprofit technology field use blogging for professional development. Part of blogher, Social Change, Non-Profits & NGOs is devoted to blogs for NPO’s and NGO’s. 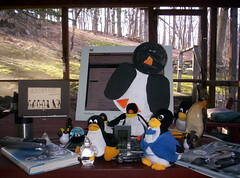 Susie’s blog can ge found at Susie’s Blog: winning hearts and minds over to FOSS. Susie’s Blogroll includes the blogs of Beth Kanter, Beth’s Blog: A place to capture and share ideas, experiment with and publish links about nptech, educational technology, information design, visual thinking, creativity, ICT in the developing world, and much more. The roll also includes the blog of Paul Webster, Regional ICT support, railway coffee, and more!. If you know of any other blogs related to volunteerism and open-source, please feel free to include them via comments to this post. Join us! Together we’re building a guide to women bloggers. In 20+ popular topics, you’ll find lists of blogs by women and constantly updating guides to what’s hot, written by our contributing editors. You can also find out all about BlogHer Conference ’06, from registration to sponsorships. Our 2005 inaugural conference sold out with 300+ attendees and national press attention, and was made possible by our amazing sponsors. BlogHer Con ’06 will double in size. I ran across a reference to a post in the blog gapingvoid: “cartoons drawn on the back of business cards”. It’s written by a chap named Hugh MacLeod. I was going to write about this, and I’ve kept the tab open in my browser for over a day, but to be honest, I don’t really have the time right now. I also realized that I had come across this blog before. And it had the same quality then that it has now — it is very, very witty. So if you want to see a very creative blog, venture into the void. You’ll have lots of company, as I just noted his blog has a technorati rating of 137, which is an amazing accomplishment. how does one build a network of trust? as old vi’er, could write a post on this. Amazing Joy write vi using 300 baud modem. Tipping point: 300 baud wasn’t useable, with 1200 and some good s/w and some patientceyou could do work, with 9600 you could do real work. Cayton Christensen’s firm. Probably a blog post in this when time permits. Anything by CC is worth a read. IBM’s 2006 Corporate responsibility report. There is more mention of open-source in this report than the prior one, and I’m hoping for even more mentions in 2007. I started the current phase of my blogging on September 17th, just over 100 days ago. In that time I have written 238 posts consisting of 168,000 words: an average of over two posts each and every day, with each post averaging about 700 words, pretty close to the length of a typical column by Tom Friedman. As part of this blog I maintain two static pages that can help locate a particular post or give an overview: Posts is a single page with a link to each post, in the order in which they were written; One Page is similar but also includes the full text of each post. I started this blog on WordPress in late February, and wrote almost 100 posts before I stopped writing in late March. The 100 posts got a total of 400 or so views. I resumed blogging in mid-September, as an experiment to see if I could improve my writing skills, and also to get a better understanding of the act of blogging, to learn what it could offer and what it couldn’t. Around noon today I got my 12,000th view. I’m now averaging over a hundred views each day. My goal was not just to learn to write better but also to learn how to “write with speed,” to be able to write something useful quicky without being held back by excessive worries about punctuation or the act of composition. One example of this can be found in the “happy birthday alphaworks” post. I wrote it under pressure, in just over an hour, producing almost 2000 words in the process. I decided to run the experiment by (1) writing intensely, forcing myself to write as much as I could, and (2) writing with risk. By writing with risk I mean that I decided to write finding inspiration whenever I could and to do that writing with as few constraints as possible, just letting the writing take me where it would. I felt that by taking risks I could speed up the learning process, and I think this was a wise choice, as writing a blog is a maddening experience in that most of the usual conventions of narrative writing just don’t apply. The problem is that usually when you write you know the reader. For example, when writing an e-mail you know to whom you are writing, why you are writing, what they know about you, what you know about them, and what points you wish to make. But when blogging you really don’t know who will read the post. Even worse, if someone does read a post, you won’t know why they decided to read it, how much of it they read, of what effect the post had on them. You may get the occasional hint in the form a comment, but you cannot assume that the comment is representative of the world at large. There is also the particular phenomenon that I term the future is now. You cannot assume that the the reader of a particular post will have read what hadscome before, since in the world of blogs the most recent posts are displayed first, so it is more likely the occasional reader will read the posts you have yet to write before reading your latest post. Thus, attempts to present a sequence of related posts, or to build a foundation before writing a conclusion, are doomed to failure. There is also the reality that when you first start blogging you will find that no one is reading your posts. Tens of thousands of blogs are started each day, so why should you assume that anyone will take the time to read yours? The lesson I drew from this is that you should write for yourself, not aiming for a particular audience. See Security through obscurity. Blogs are primarily personal or professional, with various shadings in between. In a personal blog you know little or nothing about the author’s job or their employer, and what they do say about that plays only a small role. In a professional blog you are aware of the author’s job and employer, and at the extreme it is understood that the blog itself is part of the author’s job. An important part of the blogging experience is sorting out the boundaries, especially how much to say about yourself, and how much to say about your job and your employer. There is an advantage to starting from scratch, knowing there is a small readership, as you can be more daring in your initial efforts. I did this by design, and do recommend it. I think it helped me to clarify these boundaries. Based on my past experience, I knew that I liked to write about myself — boy, did I like to write about myself. Hence I found myself soon writing quite personal posts, some of which caused a bit of distress to my family when they read them. It took a few weeks to sort this out. The defining moment for this was the “kaddish” post. As first written and posted, it had some very personal material. Shortly after posting it, I went back and deleted most of the very personal part, as I had done in a few prior posts. This is one of the benefits of blogging as compared to e-mail. You can’t revise, or take back, an e-mail. You have more freedom with a blog post. You can revise or delete it. I’ve done both. It’s also probably the case, though you might not want to admit it to yourself, that in the early phase of a blog hours or even days can pass before anyone even bothers to read a post, so you have some latitude in making revisions. I’ve also come to realize that blogs aren’t written under oath, so you have some artistic freedom. You don’t have to name a person, or even give the exact relationship, to make a point. On the other hand, with a subject’s consent you can be as free as you wish. For example, when my wife expressed concern about my frequent mention of youngest daughter Jen, Jen said she had no objection to excessive pride of father in daughter. I think one alternative to writing with risk to speed up the learning process would be to carefully read blogs by others who write in the areas you are interested in. I have spent most of my time writing and so have not done this as much as perhaps I should have. I have taken as my primary guide the blogs from the folks at Redmonk, and will be writing more about them soon. But as long as you are honest and make your intentions clean, then you should speak of your job and your employer when appropriate; indeed, that is part of being a professional blogger. And if you, like myself, have some pride in your company then blogging offers news ways to says positive things about your company; see for example, the story related at the start of the “kaddish” post. As noted, I found inspiration for many of my early posts from the daily paper, which for me is the NY Times. Examples can be found from the news, sports, business, op-ed (mainly Tom Friedman), and obituary sections. Usually the article had a direct or indirect association with open-source that suggested a theme for a post, one worth pursuing. One of the goals I developed early on was to try to attempt new forms of writing about open-source. I have found so much of the writing about open-source predictable and — all to often — quite amateurish. How many more trees need be cut down to assert that gpl is the one, true license; that all software must be free; or that every untoward event is the result of some evil machination by Microsoft? Open-source is much more nuanced than that. I find the topic endlessly fascinating, and would like to see more writing that reflects this. Open-source is also supposed to be fun, and I’ve tried to bring some fun to my posts on open-source; see for example, the “Yogi Yarns” series on “forking” written in early December. I also learned that a blog need not just be words. Having seen a few pictures on Steve O’Grady’s blog, I investigated flickr and added a few pictures to some of my posts. See for example “halloween,” “falling leaves, covering ground,” and “halloween+1.” My favorite example is of course the “Clifford” post. Blogging has its unique pleasures. One is the insight you gain into yourself. The other is the occasional writing that produces great satisfaction. Examples include the “day on the links away from the links post” that was based on one particular day in the Jikes experience, in early October 1998. Another was the “kaddish” post. I had particular fun writing the “binary search” post, trying to explain in plain language how binary search works. The “sputnik” post that evolved into a personal history of the National Defense Education Act of 1958 was also fun to put together. Another pleasure is seeing what posts people read a lot. For example I used a quote by Leigh Anne Tuohy as the title of one of my posts, and it has become my most-read post. Though I wrote it several weeks ago, it has accounted for close to twenty per cent of my views for the last few days. I have also gained some new insight into searching, though I don’t quite know what to make of it. My blog tool, WordPress, shows the search strings that have led people to read my posts, and some of them are quite surprising, so much so that I have started a separate page, Trivia, to provide some examples. For example, I once mentioned that one of my neighbors was named O’Donnell and that they had twin daughters; recently I learned that a search on “O’Donnell twins” turned up my blog as one of the prime sources on this obscure topic! I have also come to appreciate that blogging is but one component of what is known as “social networking.” Another key component is tagging, of which technorati is a good example. I also think that while early experience on just the writing is valuable, in the long run, success in building one’s social network will involve writing not just on your own blog, but in the form of comments to the blogs of others, careful tagging, and so forth. I think the key point in boundaries, whether personal or corporate, is to take no unfair advantage. To drag your employer’s name into what is a very personal post is to take advantage of your employer, as is to mention a family member in a way that is too personal. I venture that that a good way to learn more about dealing with personal boundaries and writing about one’s self would be to study the blogs written by women. They are more attuned to networking and are more sensitive in personal relationships. I vowed to myself that I would finish this post tonight, on the last day of vacation. I know I haven’t mentioned all the things I wanted to say, but if they are that important then I will remember them and write about them in a future post. So let me bring this post to a close. The experience has been educational and fun. It has been well worth the substantial investment of time I put into it. I feel I am a better writer now than when I started. I also have a better sense of my limitations. I have a sense of what I can write in an hour or so, and that helps me decide what to write about, what is possible and what is not. I was fortunate in my choice of WordPress as my blogging tool. It is a fabulous piece of software, as is the company standing behind it. I will write of it more in future posts. I do recommend that if you blog, you do it as part of an established community, such as that defined by WordPress, and not on your own. Let them take care of the software so you can focus on your writing. These hundred days of intense blogging began with the belief that it was time to take my work outside the firewall. This was perhaps the main lesson I learned from the Jikes experience. Jikes wasn’t recognized as valuable within the firewall until folks outside the firewall made clear they though it was valuable. IBM’s alphaworks taught IBM, and me, this lesson. My hunch has been confirmed. I have found blogging outside the firewall liberating and much more compelling. To blog within the firewall is to know your audience and their culture. To blog outside it is to seek out an audience and hopefully learn what is important, what you can try to make part of the the corporate culture. Key to this is building relationships, which is what social networking, as is open-source, is all about.